Is There Progress In The Chicago Teachers' Strike? 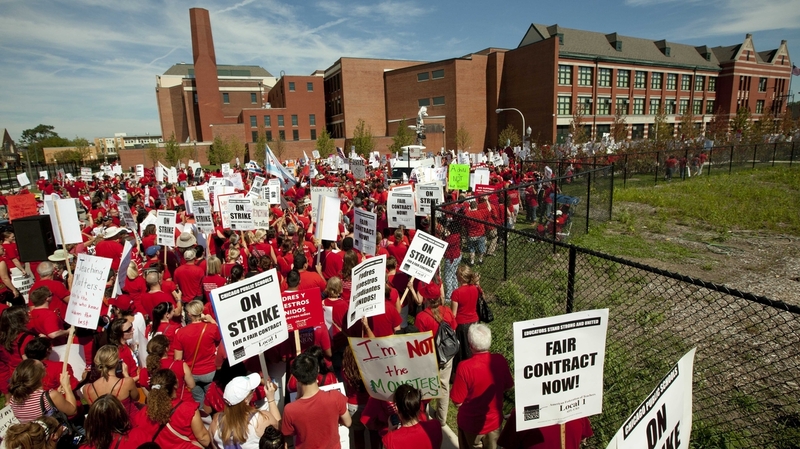 : The Two-Way There may be good progress toward settling the Chicago teachers' strike. Both sides say they have hope school children can return to the classroom on Friday. The city offered a concession to address the union's opposition to the proposed teacher evaluation system. A crowd of Chicago public school teachers marches past John Marshall Metropolitan High School on Wednesday, Sept. 12. Talks resume this morning between the striking Chicago teachers union and the city's public school system. After four days of a walkout, there's a hint of progress in contract talks. Union leader Karen Lewis and school board president David Vitale both indicated they had 'hope for Friday'. This suggests negotiators could be close to an agreement that puts teachers back in the classroom tomorrow. It may mean there's been some rapid dealing: the outstanding contract issues are thorny and both sides bargained for months before this week's walkout. Lewis told the Chicago Tribune negotiators spent a lot of time yesterday going over the most divisive one - teacher evaluations. "because it relies too heavily on students' standardized test scores and does not take into account external factors that affect performance, including poverty, violence and homelessness. They argue it could result in 6,000 teachers losing their jobs within two years. The district says the union already agreed to the new evaluation system, but it has offered to make adjustments." Wednesday, the school system offered a concession on the evaluation issue, according to the Chicago Sun-Times; teachers who initially get a poor evaluation score wouldn't be kicked out, provided that additional test scores didn't fall further. Other proposals include a new wage structure sought by the union, and a freeze on health insurance rates, as long as teachers participate in a wellness program, according to the Tribune. One issue agreed to is a longer school day. And while the school system has offered teachers a 16 percent pay increase over four years, last year the teachers' last four percent pay increase was taken back at the same time health care costs rose, notes the Washington Post. The situation is, well, politically fraught. Mayor Rahm Emanuel previously worked as President Obama's chief of staff. Arne Duncan, Obama's education secretary, once headed the Chicago school system. The walkout is getting national attention, as NPR's Audie Cornish pointed out on All Things Considered. Civil rights leader Jesse Jackson, who's from the Chicago area, arrived yesterday to meet with negotiators. He is not a mediator but told WBBM-TV in Chicago he was 'willing to help'. Jackson helped resolve the last Chicago teachers' strike in 1987. However, there's no indication that he's been included in these talks.